By Max Ailor, Times-Dispatch Outdoor Editor. Originally published April 25, 1971. Displayed with permission from the Richmond Times-Dispatch. Newton Ancarrow five years ago started studying wild flowers because he thought they were an instrument to provide him an opportunity to tell the James River pollution story to area garden clubs. Wild flowers stole his soul and photographing them became a hobby that changed his life style. One day last week there was an urgency about Ancarrow, however. And it was amplified by Dr. Miles Johnson, a botanist of Virginia Commonwealth University who joined Ancarrow for a stroll through Richmond’s new James River Park to see a strange and new find by the wild flower hunter who fights pollution. Ancarrow has made more than 35,000 color slides of the wild flowers he has found along the banks of the historic James River. He identified and photographed more than 303 species in his first years while confining his hunting between the Southern Railway tracks and the bank of the James within the city limits. Ancarrow figures there are 450 species of flowers. And Johnson says there are at least 150 shrubs and plants to be catalogued. “We are going to have to hurry if we get to them all before they give way to progress,” said Ancarrow, indicating the wide path treated for Johnson grass and weed control, the trees that had been cut to afford a view, and a six-foot wide strip of exposed clay along the edge of the park that had been cleared for a protective fence. “I was happy that the city found a way to open the James River to the public. The way they’re going about it may be progress but it sure is playing havoc with the ecology. Bulldozers just slash through – right through the middle of one of the finest patches of dwarf crested iris,” he said. Ancarrow smoothed the surrounding grass and indicated leaves shaped as coltsfoot, for which the plant is named, as Dr. Johnson joined him. A rare species, not found south of Ohio, the book says. “It is identified by the leaves because they look like the bottom of a colt’s hoof,” said Dr. Johnson. To get off the beaten paths and away from the “progress” of a wilderness park construction, Ancarrow walks slippery logs and skips rock outcroppings to gain access to new grounds that one day will be opened by foot bridges and more graveled paths. Yellow, smooth violets are profuse. 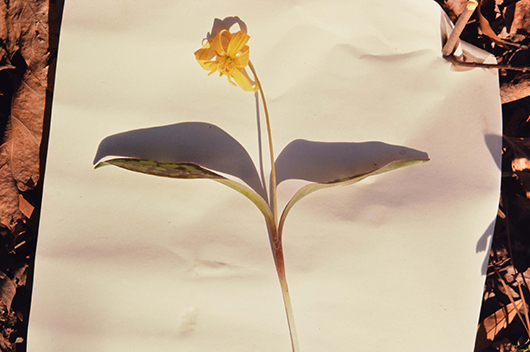 So are the dogtooth lilies or adders tongue (found mostly in glacier country) and lily of the valley carried on the list of rare, uncommon, and endangered list of wildflowers. A butterwort picked from the base of a tree. That flower also is an endangered species. Ancarrow snipped a stem of a flower from a bloodwort. The juice ran red. “Indians used the juice for war paints and colonists used it for ink,” said Ancarrow. “It also was and is used for medicine — a powder made from the root helps a stuffy nose; taken internally it relieves a stomach ache,” said Dr. Johnson. Bloodwort flowers captured by Newton Ancarrow. Until the James River flood silted in his landing and he was unable to get permission to dredge the channel last year, Ancarrow manufactured plush boats that were bought by royalty abroad. The [boat] plant was on the site along the James River where they colonial navy once anchored at the foot of Maury St. The site is directly below the Richmond sewage treatment plant disposal. Ancarrow observed the pollution of the stream, made pictures of fish that died from the pollution and of catfish and eels trying to climb out of the stream when it became unbearable. For years he was a one-man crusader for a clean James and was ahead of the recent birth of interest in the environment and earth day, which closely coincided with the closing of his business because of pollution by silt and flood. “I’ll show you what I mean,” he said. He picked a purple violet. “There are several species here. This one you have to tear open and look at the small pistil. It has a hole in the tip.” He put the pistil of the violet under a 15-power magnifying glass he carries in his camera case to see the minute hole. 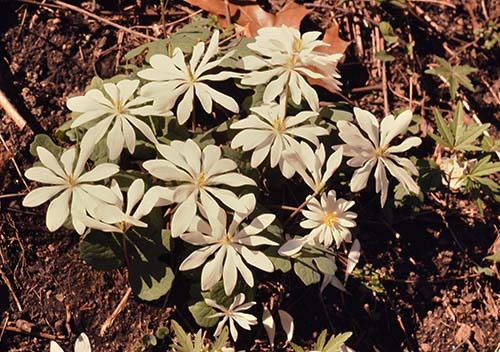 Ancarrow plucked a bloom of a greater chickweed. “You’d say that it has ten petals. Look at it. Each petal is forked. It has five petals. “I am trying to put together a book for the layman…the guy like myself who wants to enjoy wildflowers and be able to identify them by their color, leaves, things that are easily identified so one may be separated from another at a glance in the book. It is a fascinating type of hunting. Hunting with a camera is a new sport whether it be for wildlife, flowers, or insects. Knowing the history of each living thing, according to Ancarrow, gives one a new outlook on life. See the original article in print (PDF).